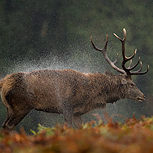 One of the most vivid sights and sounds of British autumn is the roar of a Red Deer stag and the clashing of antlers as they fight for breeding supremacy. 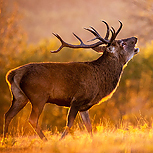 Throw some of the most vivid landscape colours of the year into the mix and the chance to work with a photographer who knows the East Midlands based herds of both Red and Fallow Deer better than anyone, as they’re literally on his doorstep and this weekend is a chance for both an image fest and a field craft lesson as well. Add in a session in some stunning locations for some excellent captive bird of prey shots (hopefully including Merlin and Peregrine) and this represents an excellent compact break for beginners and experts alike. Day 1: We are all due to arrive at our guest house by 9.30 am. We will then transfer to our location for the captive bird of prey session. We will be working until late afternoon with several birds from peregrine falcon, Sparrowhawk, barn owl, Merlin and Golden Eagle, this list is not finalised, and our falconer might have something else for us on the day. We make the images and the birds look as natural subjects and falconer and I have worked together for many years, so he knows what to expect working with photographers. We will stop at lunch time for our packed lunch and the evening we will then transfer to our guest house to check in and for our evening meal. Day 2: It’s an early start in the morning and Linda our host at the guest house will provide a continental breakfast. The mornings at Bradgate Park are in my opinion the best time to photograph the rutting deer and it is therefore important to be in position before the sun comes up (which means getting up at around 5.30). We have organised this trip to coincide with the peak of the red and fallow deer rut so will get lots of opportunities for photography throughout the day. At lunch time we head back to the Horseshoe Cottage for lunch. We will then go back into the park for the afternoon session and stay until dusk so it is a long day but we will take plenty of breaks throughout. Again back to our Guest house in the evening for our main meal. Day 3: Again it’s an early start in the morning to try and get the best light and activity and the day will be a repeat of the previous day and will go on until dusk, but if you have a long drive home you are free to go when you please throughout the day. All meals are provided throughout the three days with lunch back at the farmhouse on the Saturday and Sunday, home cooked evening meal on the Friday and Saturday nights and a continental breakfast on the Saturday and Sunday mornings. Also, a packed lunch is provided on the Friday and again if you could let us know what you don’t/do like or any special dietary requirements that you might have. Travel to East Midlands, some local travel (for your convenience), sundry items and alcohol. Our accommodation will be a local award winning guesthouse set in beautiful surroundings and is based on twin rooms. Single Supplement available on request. Delicious home cooking is all provided. The walks around the various locations are generally flat and relatively easy going, but may involve some uneven terrain and inclines.